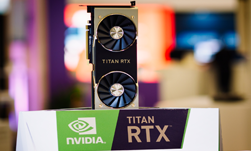 At NeurIPS in Montreal, Canada, NVIDIA introduced the TITAN RTX, the world’s most powerful GPU for the PC, providing massive performance for AI research, data science and content creation. Below is a summary of the newly announced developer software which will take advantage of the NVIDIA Turing architecture behind the TITAN RTX. The Video Codec SDK includes a complete set of APIs, samples and documentation about hardware accelerators used for video encode and decode on NVIDIA GPUs, for Windows and Linux. The video encode and decode accelerators (NVENC and NVDEC) are dedicated hardware blocks on NVIDIA GPUs, and are independent of CUDA Cores. Turing brings substantial video encode quality improvements in all GPUs. Additionally, Turing brings up to 3x improvement in the video decoder throughput in NVIDIA professional cards (Quadro & Tesla). Notable features of Video Codec SDK 9.0 are: Higher quality encoding for H.264 & HEVC, ~15-18% lower bitrate than Pascal at same quality, support for HEVC B-frames, HEVC 4:4:4 decoding, direct video memory output for encoded bitstream. Video Codec SDK 9.0 is available now to select developers through our early access program and the public release is planned for early 2019. Register for early access. The latest 18.11 release of NVIDIA GPU Cloud (NGC) containers for deep learning frameworks and libraries help accelerate deep learning training with minimal effort for researchers and developers. Learn more about the recent optimizations in this blog. Download the latest deep learning framework containers from NGC.